Melbourne, Australia – Friends and supporters of Australian-based refugee Hakeem Al-Araibi are stepping up calls for his release from detention in Thailand, where he faces extradition to Bahrain, the country where he was born. Al-Araibi, who once played football for Bahrain’s national team, appeared in a Bangkok court on Tuesday where the judge extended his detention by 60 days to give Bahrain time to make its case. “Please stop them,” a handcuffed Al-Araibi told journalists as he was escorted outside the courtroom in a video circulated on social media. “I am Australian, not Bahraini. I didn’t do anything,” the 25-year-old added. A group of the footballer’s friends – mainly refugees, asylum seekers and students of Bahraini descent -have been holding a protest outside the Thai consulate in Melbourne, Australia’s second city, day and night for the past few days. “I think Hakeem has been targeted because he’s a national figure, plus his brother is very active [politically], so they just target the whole family,” said Bassam*, one of Al-Araibi’s friends. Thailand said it was acting on an Interpol “Red Notice”, an international arrest warrant that had been issued at Bahrain’s request when it detained Al-Araibi on November 27 after arriving in Bangkok for his honeymoon. The footballer, a Shia Muslim in a country that’s predominantly Sunni, fled Bahrain four years ago saying he had been tortured after being arrested in 2012. Australia recognised him as a refugee last year. “This is someone who fled his home country after being tortured, and there is every risk he will face the same treatment again if he is forced back,” Evan Jones, programme coordinator at the Asia Pacific Refugee Rights Network, said in a joint statement with ASEAN Parliamentarians for Human Rights. Bahrain convicted Al-Araibi in his absence of vandalising a police station, sentencing him to 10 years in prison. He has denied the charges, saying he was on the pitch in a football match at the time. Since arriving in Australia, Al-Araibi had built a new life for himself in Melbourne’s sprawling suburbs, playing as a defender for Pasco Vale, a semi-professional club in the city’s northwest. “There was no coincidence that his role was a big assistance to our performance,” Pasco Vale coach Vitale Ferrante told Al Jazeera, adding that the team had just enjoyed its best-ever season. “From when he walked through the door he was just a humble, respectful individual and he fitted in straight away,” said Ferrante. Bassam described him as “very charming”. 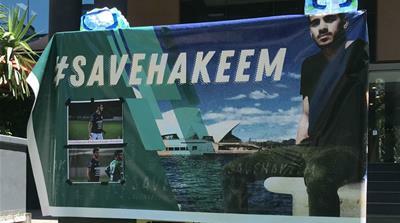 Australia’s wider footballing community has rallied around the player. Football Federation Australia has written to the Thai ambassador in Canberra, while Football Victoria, which oversees the sport in the southern Australian state, said it had sent a letter addressed directly to Thailand’s Prime Minister Prayut Chan-ocha. “Everybody’s really shocked,” said Ferrante, the coach. “Being Australian, we’re not exposed to this kind of stuff. I think it’s shaken everybody up and everybody’s really concerned about his welfare,” he added. “It’s not just about political stuff, it’s about humanity,” added Jalil*, another friend protesting against the detention outside the Thai consulate. Australia’s Foreign Minister Marise Payne has expressed her concern at Al-Araibi’s detention and called on Thailand to return him to Australia. “Returning Mr Al-Araibi to Bahrain from where he fled would contravene his rights under international human rights law,” Payne said in a statement. Australian consular officials had visited Al-Araibi and were in regular contact with him, she said. Fatima Yazbek, the secretary of the Sydney-based Gulf Institute for Democracy and Human Rights, said Hakeem faced the risk of “jail, torture, (and) unfair trial” if returned to Bahrain. “His life would be in danger,” she told Al Jazeera. What happened to the revolution in Bahrain? “We were in jail when we were in Bahrain,” said Abdullah*, another Bahraini refugee outside the consulate in Melbourne. Thailand is not a signatory to the United Nations refugee convention and the footballer could face months in detention in Thailand as the case moves through the courts.